X-Rays were first discovered on 8 November 1895. 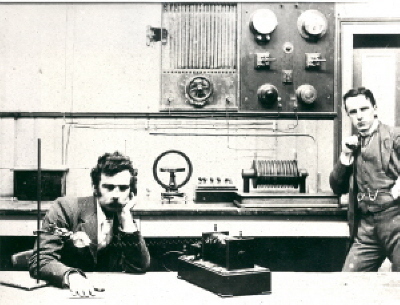 By 18 July 1896 staff members of the Ballarat School of Mines (SMB), were experimenting with the exciting new discovery. The School of Mines Ballarat kept abreast of affairs worldwide. In 1896 they became aware of the experiments carried out in Germany by physicist Wilhelm Conrad Roentgen involving electro-magnetic radiation and the Roentgen Tube. The experiments of Roentgen involved the impact of a stream of fast electrons on a target in the vacuum of a glass bulb were the forerunner of today's x-rays. The discovery of x-rays should also recognise the contributions of many early discoverers. Otto Von Guericke created the first air pump for creating a vacuum in 1650. Faraday invented machines capable of developing electrical energy that could be used as a source of power. Ruhmkorff produced an induction coil in 1851, and it was the Ruhmkorff tube that Roentgen used to develop high tension currents which were required to excite vacuum tubes. The fluorescent screen was produced by other physicists after experiments of ultra violet rays and the investigation of the propensity of barium-platino-cyanide crystals to have the property of giving off visible light while in the path of an ultra-violet beam. In 1859 Geissler, and in 1865 Herman Sprengel, studied the vacuum tube. Physicists such as Sir William Crookes in 1875 began to study electrical discharges in rarefied gases. The history of x-rays began on 8 November 1895 at the University of Wurzburg in Bavaria. The discovery was officially announced on 25 December 1895. 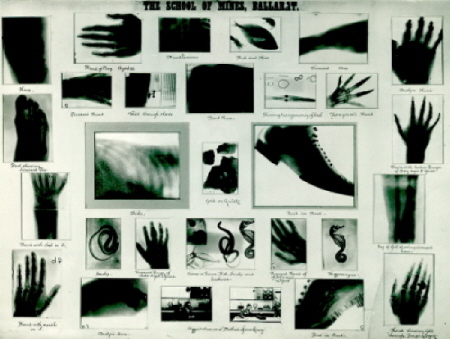 The first radiographs in Ballarat were taken at the School of Mines in July 1896 according to the SMB Annual Report. 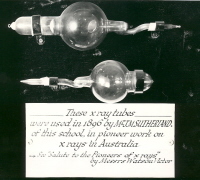 Frederick J. Martell, the Registrar of SMB arranged for the importation of tubes, while John M. Sutherland, an electrician, conducted most of the experiments giving 6 inch, 12 inch and 16 inch sparks respectively. In a short time brilliantly successful results were obtained, with some SMB Roentgen negatives taken at this time still in existence today. The Ballarat Courier reported on 20 July 1896 that: "Thanks to the energy of the staff of The School of Mines, Ballarat, and particularly to Messers F.J. Martell and D. McDougall, the assistance of Rontgen X-rays will soon be available, for the relief of suffering humanity, at this institution." Mr Martell is an ardent amateur photographer, and Mr McDougall's experience as an electrician has enabled the two gentlemen to carry their experiments on to a perfectly successful issue. At first these gentlemen, together with Professor Purdie and Mr W. Huey Steele, conducted a series of experiments by the aid of a Bonetti glass-plate induction machine which had been constructed by Mr McDougall. The results were very good, the various bones of the hand being distinctly visible. Warren Perry wrote: 'Because of the success of these experiments and because of the public interest in this new discovery it was decided to conduct further experiments at the School but to conduct them publicly'. A number of visitors who included members of the medical profession were invited to the SMB on Wednesday evening 22 July 1896. The 1896 invitation to an x-ray demonstration was extended by Mr Andrew Anderson, the president of SMB. A number of ladies and gentlemen witnessed a series of experiments with the Rontgen x rays, as applied to photography. A great many experiments were made, and perfect results attained. The experiments were of a very practical character, and included several interesting cases of fractured bones which had proved exceedingly difficult to treat. The School's Director, Mr J. J. Martell has been inundated with communications and requests from persons who wanted to have certain parts photographed in order to locate the exact nature of fractures of bones, etc. At the time it was thought 'that before long the authorities at the School will be fully prepared to join their skill with that of the surgeon in the relief of suffering humanity'.